All inclusive San Stefanos holidays are in the north east of Corfu. Its main income is from tourism and fishing. All inclusive family 2019 / 2020 packages in San Stefanos are mainly seen as high end breaks away. You won’t find brash theme pubs or noisy amusements around here, just hip bars and picturesque tavernas. The locals here are friendly and helpful if you are looking for a nice restaurant or captivating beauty spot. San Stefanos is enveloped by pretty green hills that protect it from winds and you can see Albania from the coast here. Suitable for: Families and Couples. Beach: Blue Flag and sandy beach. The best word to describe San Stefanos holidays is quiet. Familes and couples love it here as the seclusion of the resort really gives visitors the chance to spend some quality time together. 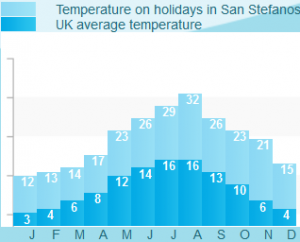 The bars and tavernas get a little more boisterous in the peak months of summer when the majority of visitors frequent 2019 or 2020 cheap holidays in San Stefanos but apart from that most nights here a laid back and relaxed.